This year’s I/O conference by Google was focused severely on service updates and developer support. However there was one announcement that took the eyes of many. Google and Samsung paired up once more to release a completely new version of the Galaxy S4, software wise. It’s the ‘Google Edition’ S4, that will run on pure Android with no Samsung software in it. 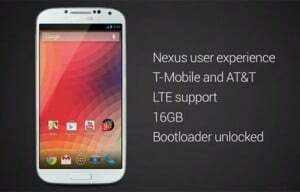 So to say, it will be just like a Nexus device, except it will have the same hardware as the regular Galaxy S4. The Samsung powered Galaxy S4 comes with a full load of pre-installed apps and software features that for some people, are only unnecessary filling up the internal memory. So the idea of a clean, stock Android experience on a device so powerful such as the S4 really hits the spot for many. I personally can’t wait to get my hands on such a device. It will be available starting with June 26, in the US, through Play Store. A lot of us were expecting the release of a new Nexus device at this I/O, but as the event got closer the idea of this faded. However, Google did a brilliant move by releasing the Google Edition Galaxy S4. It’s so simple it’s genius. Take the best phone on the market, hardware wise, and install the purest version of Android on it. This is as good as the Nexus 5 can be at the moment. One of the big advantages of running stock Android is the fact that whenever a new update is released by Google, the Nexus devices and now the ‘Nexus S4’, will be the first to get it. Just remember how long you had to wait for the Jelly Bean on your device, while all others that had a Nexus we’re already getting bored of it. Another advantage is the fact that it comes with an unlocked bootloader and there aren’t any Samsung software installed on it. First of all, the device will only be available with T-Mobile and AT&T and only in the US, for now, Google says. You will only be able to buy it through Play Store, and that didn’t work very well for the Nexus 4. Another big disadvantage, comparing it to previous Nexus devices, is the fact that it will cost as much as the normal S4, which is over $650. The Nexus range is famous for the best price-quality ration, meaning you pay the lowest price on the market and you get the best features. But that’s because usually Nexus is sold by Google, which has other intentions for the device rather than making money out of selling it.